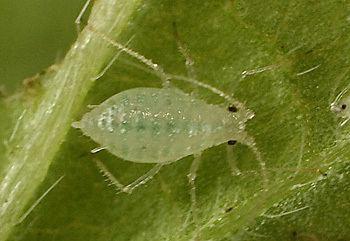 Cryptomyzus is a genus of fragile pale whitish, straw-coloured or very pale green aphids the adult viviparae of which may be winged or wingless. The apterae have long antennae and long capitate hairs on the body which are placed on warts. They also often have such hairs on the antennae and legs. The dorsal cuticle in wingless forms is colourless and membranous. The first antennal segment usually has an angular projection at its apex. The siphunculi are thin and either cylindrical or slightly swollen. The cauda is rather blunt. Winged forms have a blackish dorsal patch in front of the siphunculi which may be broken up by colourless lines or patches. 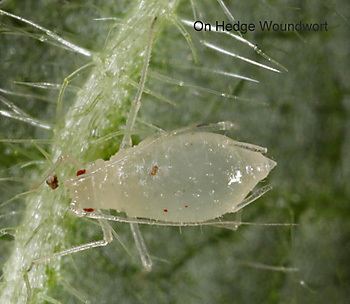 The hairs of alates have almost normal apices and are not placed on warts. There are 17 species worldwide. 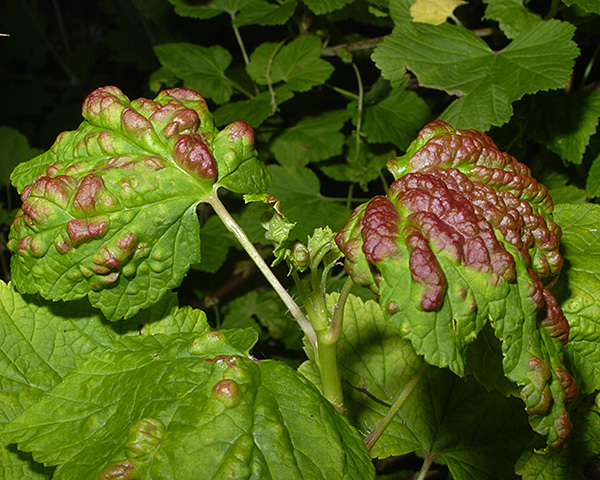 Typically, Cryptomyzus species retains a sexual stage in their life cycle and host alternate from species of currant (Ribes, in the Grossulariaceae family) where they cause leaf distortion to various species of mint (Lamiaceae). However, some forms live continuously on currant or mint. 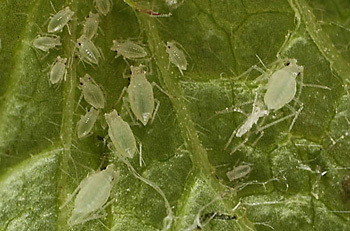 Apterae of Cryptomyzus alboapicalis (see first picture below) are pale greenish with a green median stripe or yellowish with greenish transverse intersegmental stripes. The antennae are much longer than the body, and the antennal terminal process is more than ten times the length of the base of antennal segment VI. The body and appendages have numerous thick, capitate hairs. The siphunculi are slightly swollen and 1.0-1.5 times the length of the cauda. The body length of Cryptomyzus alboapicalis apterae is 1.6-2.9 mm. 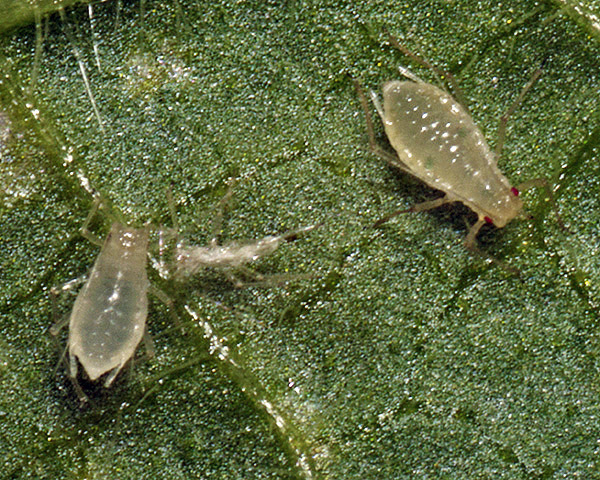 Alates of Cryptomyzus alboapicalis (see second picture above) have a dark brown dorsal abdominal patch, deeply indented along the sides. Cryptomyzus alboapicalis feeds on the undersides of the lower leaves of white dead nettle (Lamium album) and occasionally on other related species. It does not host alternate, and it is not attended by ants. Oviparae and males are produced in autumn, and the species (usually) overwinters in the egg stage. It is found in Britain and across northern and central Europe to western Siberia and the Caucasus. Adult apterae of Cryptomyzus ballotae (see first picture below) are dark grey-blue to mottled light green. Their antennae are 1.1 to 1.3 times the body length, with a terminal process that is 5.9-9.0 times the length of the base of antennal segment VI. The apical segment of the rostrum is 1.5-1.6 times the length of the second hind tarsal segment. The body and appendages have numerous thick capitate hairs. Abdominal tergite III of Cryptomyzus ballotae has 2 pairs of equally long spinal hairs, 1-2 pairs of pleural hairs, and 3-5 pairs of marginal hairs. The siphunculi of Cryptomyzus ballotae are swollen on the distal part and are 3.7-4.1 times the length of the rounded triangular cauda. The body length of adult apterae is 1.7-2.1 mm. The alate female has a large quadrangular dorsal patch on tergites III-VI, as well as marginal and pleural sclerites. 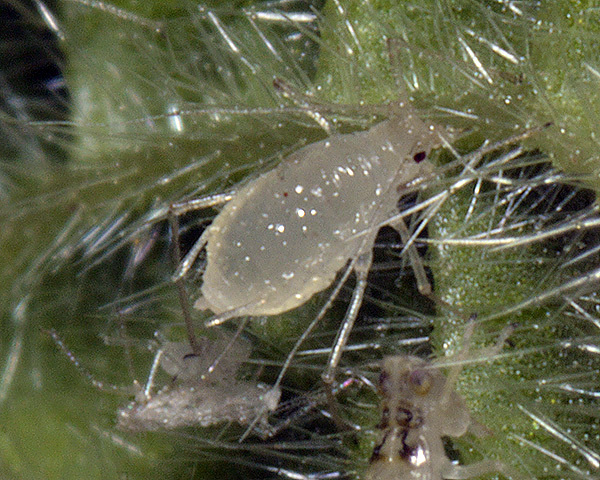 The hairy horehound aphid does not host alternate. It feeds on black horehound (Ballota nigra) and other Lamiaceae including white dead-nettle (Lamium album), red dead-nettle (Lamium purpureum) and balm (Marrubium vulgare). Oviparae and alate males have been obtained in the laboratory, but the species is thought to mainly overwinter as parthenogenetic viviparae. Cryptomyzus ballotae is distributed over most of central, western and southern Europe. 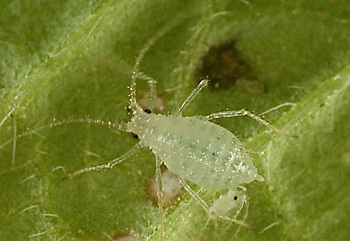 Adult apterae of Cryptomyzus galeopsidis on their primary host are pale greenish-white, or sometimes yellowish, often with a darker green spinal stripe (see first picture below). Their antennae are longer than the body with the antennal terminal process 9-14 times longer than the base of antennal segment 6. The longest hair on the third antennal segment is distinctly longer than the basal diameter of that segment. Abdominal segments I-V each have 6 thick capitate hairs, two spinal, two pleural and two marginal, arising from tuberculate bases (see first picture below of aptera on its secondary host - hemp nettle) . Their siphunculi have the distal third slightly swollen, and are 1.1-2.1 times longer than the cauda. The body length of apterae is 1.3-2.6 mm. Cryptomyzus galeopsidis alatae have a large quadrangular dorsal abdominal patch on tergites III-VI, which is more-or-less divided intersegmentally into broad cross bands. Antennal segment III has 40-60 prominent secondary rhinaria. The ovipara is yellowish without a green median stripe. The alate male has a dark dorsal patch and cross bands. In spring Cryptomyzus galeopsidis lives on the underside of young leaves of blackcurrant (Ribes nigrum) and rarely on other Ribes species. It does not induce a gall on blackcurrant. In June it migrates to hemp nettle (Galeopsis), and other Lamiaceae, where it curls and rolls the young leaves. Some populations do not migrate from Ribes, and are currently regarded as subspecies of Cryptomyzus galeopsidis. The species is common and widespread throughout Britain and Europe, and is also found in the Russian Far East and North America. Cryptomyzus korschelti apterae, on their secondary host, are pale greenish-yellow with a bright green median stripe and further green mottling over the dorsum. The dorsal body hairs are thick and capitate, much longer than the basal diameter of the third antennal segment, and arising from tuberculate bases (cf. Cryptomyzus stachydis where dorsal body hairs are mostly shorter than the basal diameter of the third antennal segment). The siphunculi are distinctly swollen on the distal half, and are 3.1-3.9 times the length of the cauda (cf. Cryptomyzus ribis which has siphunculi 2.3-3.1 times the length of the cauda and Cryptomyzus galeopsidis which has siphunculi 1.1-2.1 times the length of the cauda). The body length of Cryptomyzus korschelti apterae is 1.6-2.9 mm. Their alatae (see second picture above) have a large trapezoid dorsal abdominal patch, and have 38-57 secondary rhinaria on antennal segment III, 5-27 on segment IV and 0-14 on segment V.
The woundwort aphid host alternates from alpine currant (Ribes alpinum) to hedge woundwort (Stachys sylvatica). On currant they live beneath red or yellow leaf blister galls. Cryptomyzus korschelti is widespread in Britain and Europe eastward to central Asia. Cryptomyzus maudamanti apterae are pale yellow to light green, occasionally with a faint green longitudinal stripe. Their antennae are about 1.5 times the body length, and the terminal process is about 9.6 times the length of the base. The longest hairs on antennal segment III are longer than the basal diameter of that segment, similar in length to those on the antennal segment I. Abdominal tergites I-IV each bear 8-14 capitate hairs. Their rostrum reaches the hind coxae. The siphunculi of Cryptomyzus maudamanti are slightly but distinctly swollen on the distal part (more so than in Cryptomyzus galeopsidis) and about 3-4 times as long as the cauda. The body length of Cryptomyzus maudamanti is 1.1-2.3 mm. The alate (see clarified mount below) has 3-4 broad, rather short , brown, dorsal cross bars, much like Cryptomyzus galeopsidis. Cryptomyzus maudamanti host alternates from Ribes rubrum (redcurrant) to Lamium galeobdolon (yellow archangel) and other Lamium species. 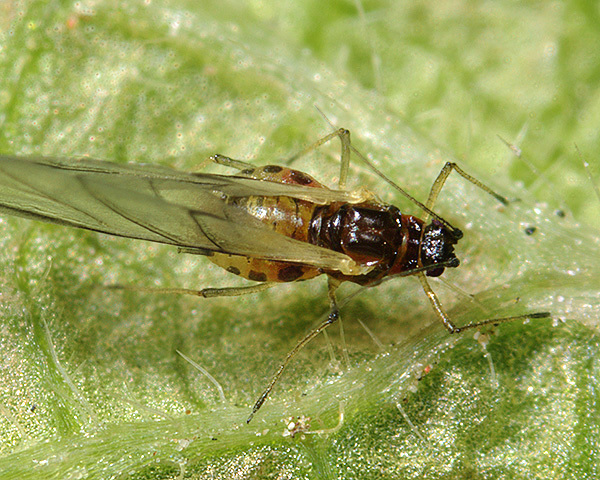 Oviparae and alate males occur in autumn. Cryptomyzus maudamanti is found in England, Netherlands, Germany, Lithuania, Czech Republic and Italy. 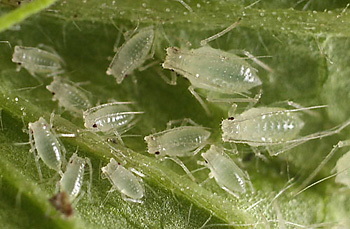 Cryptomyzus ribis apterae on their primary host are whitish to pale green or yellowish often with a greenish median stripe. The antennae are about 1.2 times the body length, and the terminal process is 9.0-11.5 times the length of the base of antennal segment VI. The longest hair on antennal segment III is much shorter than the longest hair on the inner side of antennal segment I. Their dorsal hairs are thick and capitate. The siphunculi of Cryptomyzus ribis are more or less cylindrical (cf. Cryptomyzus korschelti which has the siphunculi distinctly swollen on the distal half). On the primary host the siphunculi are about 3-4 times the length of the cauda, but on the secondary host they are usually shorter relative to the length of the cauda (2.4 - 3.1 times). The body length of apterae is 1.6-2.3 mm. 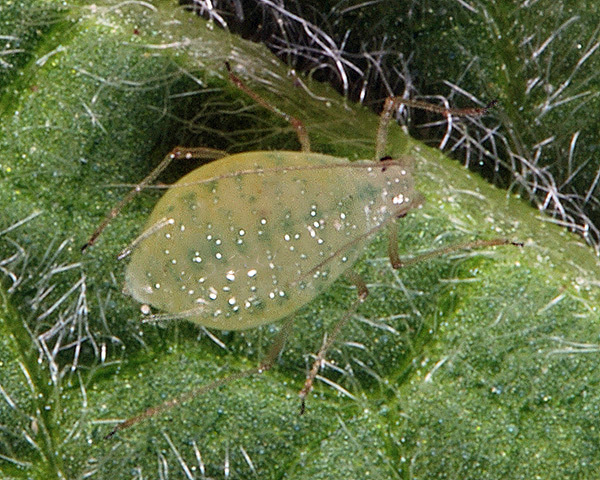 The alate has a dorsal abdominal patch indented at the sides, and 31-47 secondary rhinaria on antennal segment III, 11-27 on segment IV and 1-10 on segment V.
The redcurrant aphid host alternates between redcurrant (Ribes rubrum) and woundworts (Stachys spp.). Raised leaf galls are produced on Ribes (see picture above) which are broadly open on the underside where the aphids live. The upperside of the gall turns bright red. 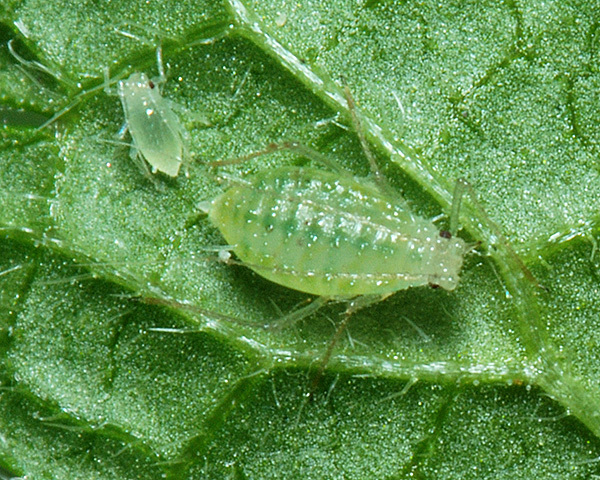 Red currant aphids are found throughout Europe, Asia and North America, and can be a serious pest of currant bushes. Had rather a nice aphid on Hedge Woundwort [Stachys sylvestris] today, although very windy and a few trees about so don't know if it's species specific. 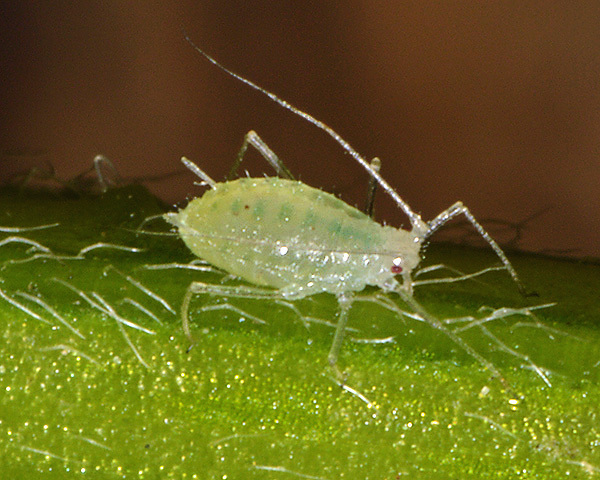 Your aphid on Stachys could be interesting, but is more likely to be an accidental. Did you check the plant for any first instars which would suggest it was on its correct host?? If it was on its correct host, the only one that would fit is Uroleucon stachydis, but this is an eastern European species and has not as far as I know been recorded in Britain. Also in that species the cauda (of the aptera) is dusky to dark, whilst yours (on the alate) is pale. My only suggestion is to check plants in the same area again, and see if they have any others on them. I did check, have been checking most things, we've a glut of sycamore aphid on everything at the moment because of the recent winds, we're also finding it on a lot of other tree species including Laburnum and Southern Beech. 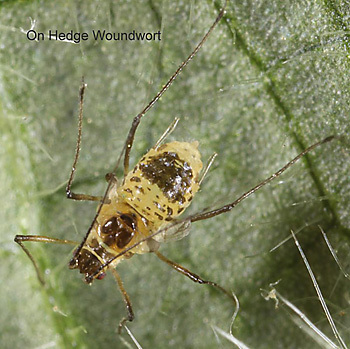 The Hedge Woundwort Aphid was a bit of a one off and might be associated with oaks that were planted alongside the other side of the path, they weren't mature, probably 30 years or so old or a little less, beech and ash about but I cannot be sure if Uroleucon stachydis or not, one to follow-up. 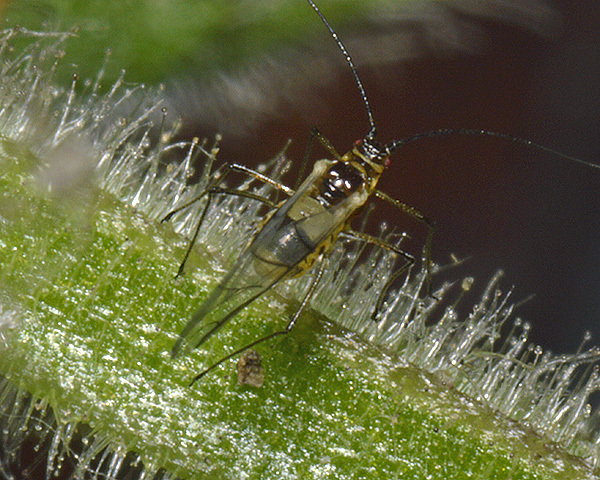 Found a curious aphid on Hedge Woundwort, Stachys sylvestris, yesterday; both aphids in images below were on the same leaf, nymphs were few and far between but occurred on a few leaves, I could only find the one adult. Hope the images are good enough and hope you know what it is. It was in Penlee Gardens, Penzance, so a multitude of species it could have come off, if host isn't Stachys or another Lamiaceae. Trees around included Horse Chestnut, Sycamore and Holm Oak. Sorry about delay in replying - lots of things to do at the moment and the aphid piccie you sent me was a bit tricky. I'm reasonably certain that the aphid is a Cryptomyzus because if you look very carefully you can see the characteristic capitate hairs (with a knob on the end of each hair). The swollen shape of the siphunculi strongly indicates C. stachydis. But the aptera of Cryptomyzus stachydis is described as "pale yellowish, whitish or pale green, with a spinal row of green spots". Clearly not what your one looks like. However if you look at your picture of the adult carefully, you will find it has two partly inflated wings. It is in fact an alate where the wings have not properly inflated, and Cryptomyzus alatae have "a dark dorsal abdominal patch" which yours has. It is mainly a northern European species and certainly an interesting find. 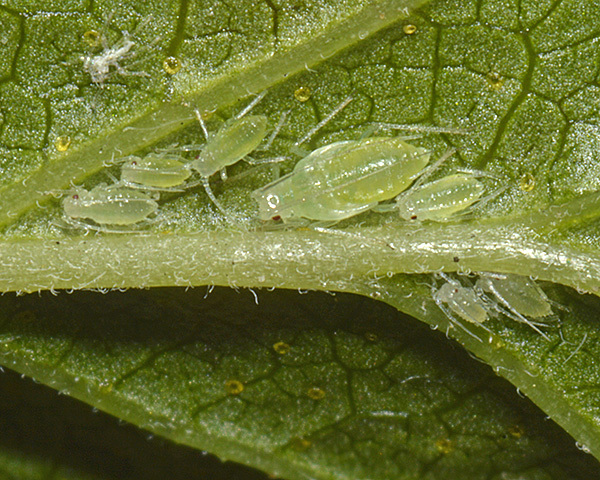 Re aphids on Stachys sylvestris, the Cryptomyzus group are difficult. It may be Cryptomyzus stachydis, although they are supposed to have a spinal row of green spots, and there is no sign of that in your or my specimens. Another possibility is Cryptomyzus korschelti. 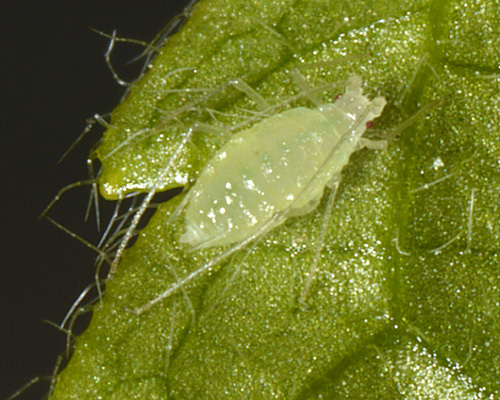 The other aphid you pictured looks like a Cryptomyzus alate where the wings have failed to develop properly - the black spot is typical of Cryptomyzus alates. Yes you already mentioned this and I uploaded as C. stachydis, will change to add possibility of Cryptomyzus korschelti as well; will also make sure I do pretty much the same for the Cavariella pastinacae / C. theobaldi. Given I've hardly any literature here probably best I try and stick to displaying the obvious on my sites, but keep photographing as much as I can, and of course anything out of the ordinary. 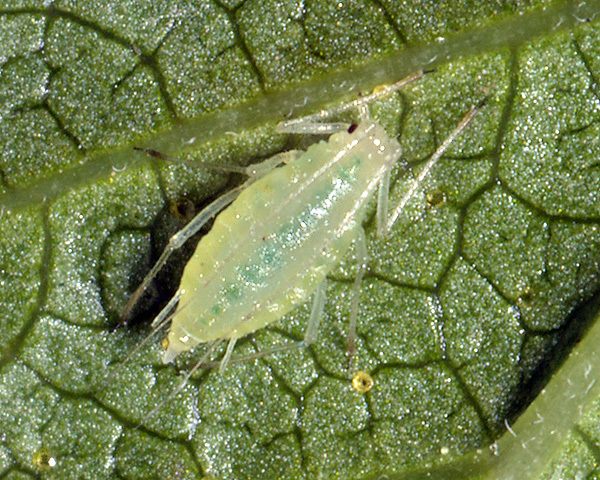 Personally speaking I'm pretty much enjoying looking at aphids, as there's often a close ''plant'' association. 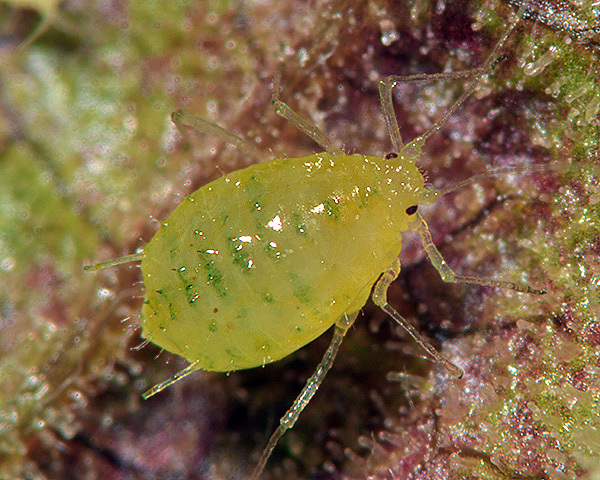 Of course my expertise lies with plants and botany, so there's a distinct advantage I can use to find and ''possibly'' identify aphids; and of course also knowing plant relationships and families in detail helps. I have a couple of queries on aphid species collected yesterday if you wouldn't mind having a look at the images below please. [These were] found on Lamium album at the edge of the Recreation Ground of Clifton, Beds (TL168390). Body and appendages have thick capitate hairs, antennae VERY long, siphunculi and cauda short. Individuals are all less than 3mm and very pale. Would I be OK in assigning this to Cryptomyzus alboapicalis or are there any other species with which this might be confused and which also occur on Lamium album? There are nine species of Cryptomyzus that have been recorded on Lamium album. Some have not been found in this country, but a lot have. You have to check antennal and siphuncular measurements and ratios to be reasonably confident, but every time we have done this on Cryptomyzus from Lamium album, it comes out to this species.